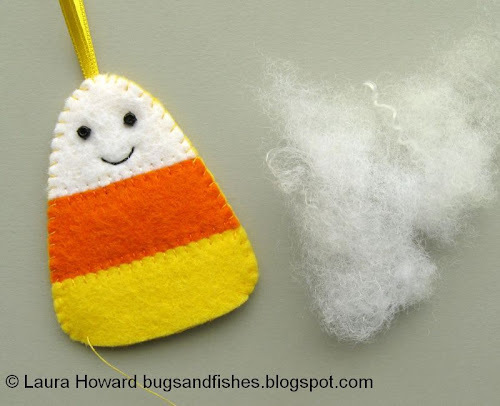 Today I'm sharing a free tutorial for making cute felt candy corn ornaments! 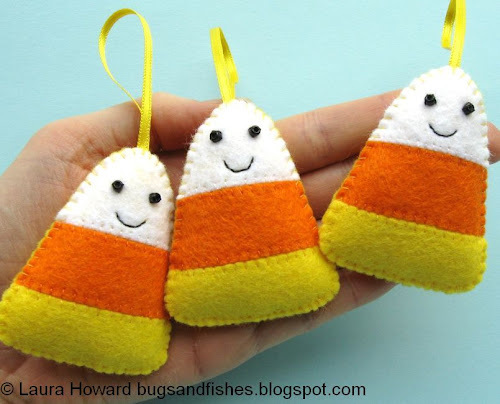 These ornaments are quick and easy to sew. They'd be a sweet addition to your Halloween party decor, or a nice gift for a Halloween-loving friend. One is cute, lots are even cuter! 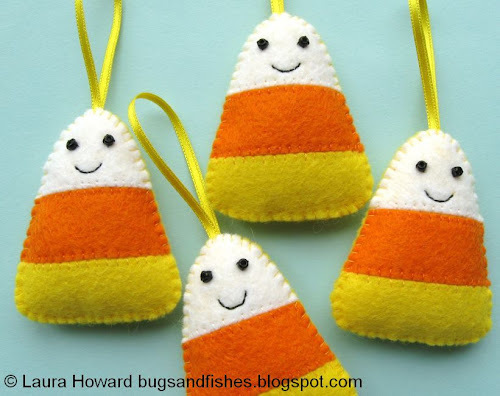 You could make a whole set and string them on a long ribbon to make a candy corn garland. 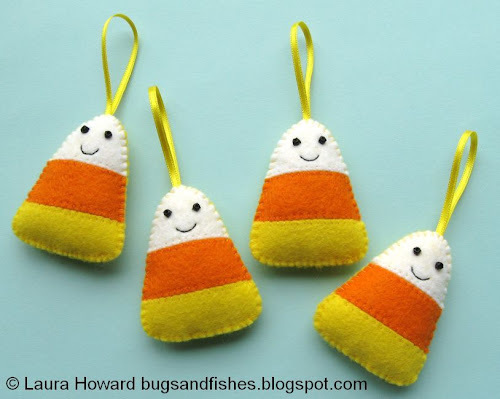 Don't have anywhere to hang them at your party? No problem! Leave off the ribbon loop and just dot them around the room: propped up on your bookshelves or scattered across a table between all the Halloween treats you're serving. 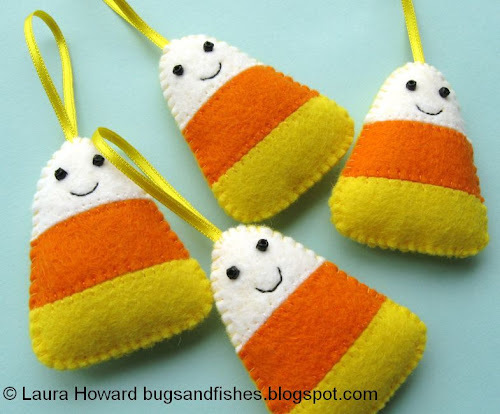 NB: due to their size and their seed bead eyes, these little candy corn should be kept out of reach of babies and small children. 1. Use the templates provided to cut out the three felt pieces, as labelled. 2. 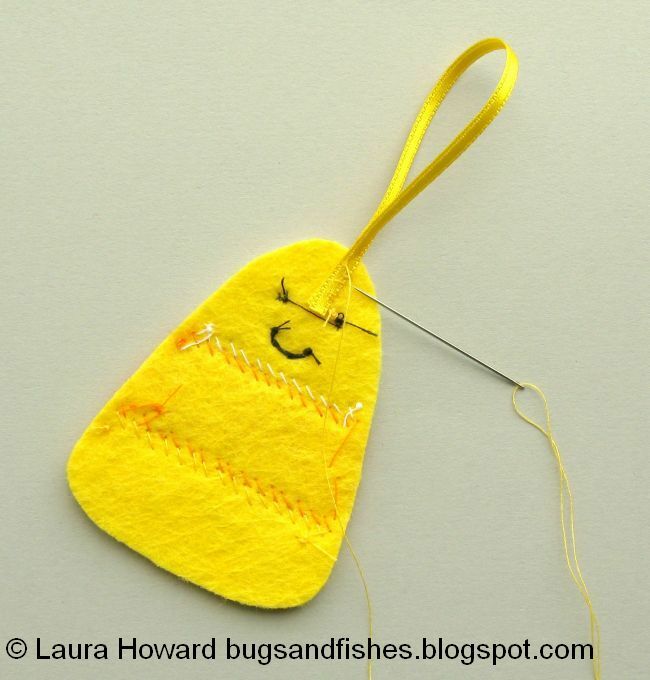 Sew each of the three sections to a piece of yellow backing felt, sewing the sections flush with each other. Use matching thread and whip stitch, sewing along the straight inner lines only. 3. Add two seed bead eyes and a stitched mouth, using black thread. 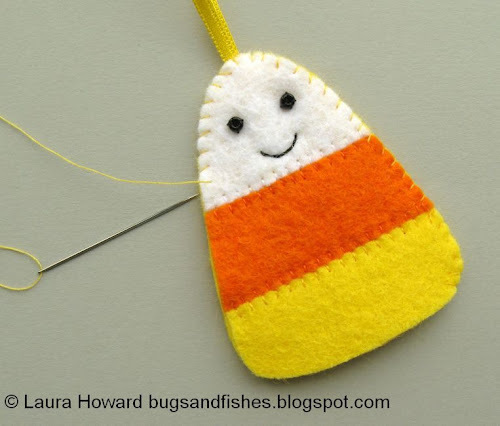 Sew each bead eye flat like an O with three or four stitches. 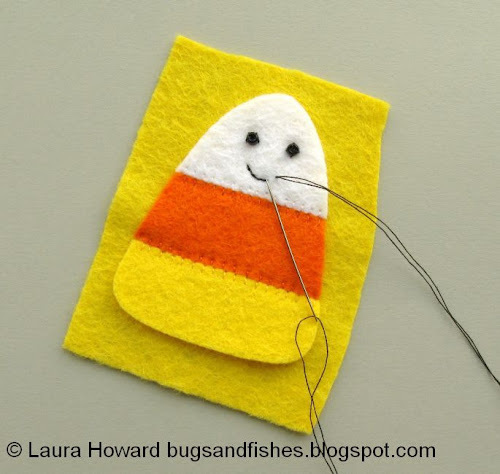 Then use a double thickness of thread to sew the smile. 4. 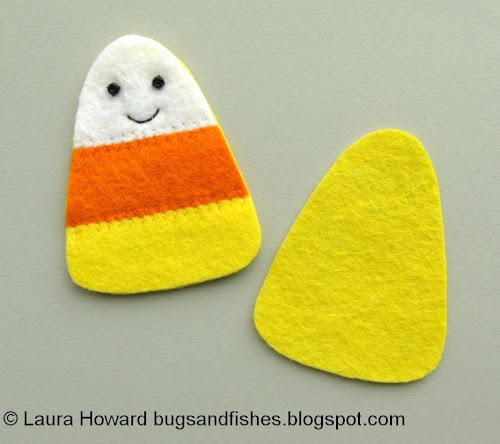 Trim away the excess backing felt. 5. Using the candy corn you've just cut out as a template, cut a matching piece of yellow felt. 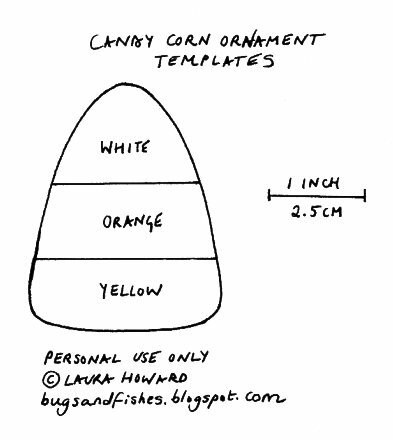 This will be the back of your ornament. 6. Turn over the front piece. Cut a length of narrow ribbon approx 5 inches (12.5 cm) long. 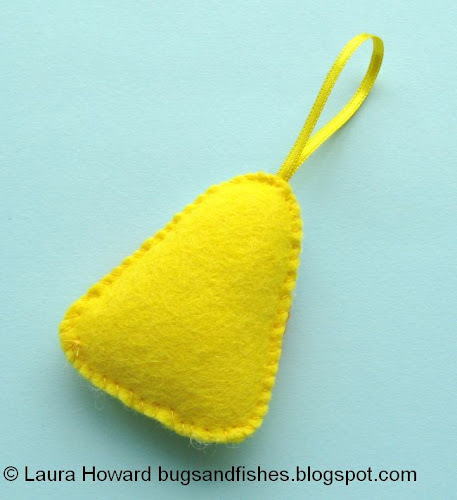 Fold it into a loop and stitch the ends to the top of the ornament, using whip stitch and sewing into the felt not through it. 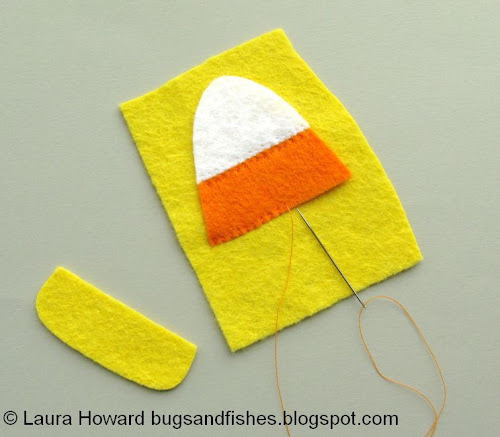 If you're worried about sewing through the felt, stitch the ribbon to the back piece instead. 7. 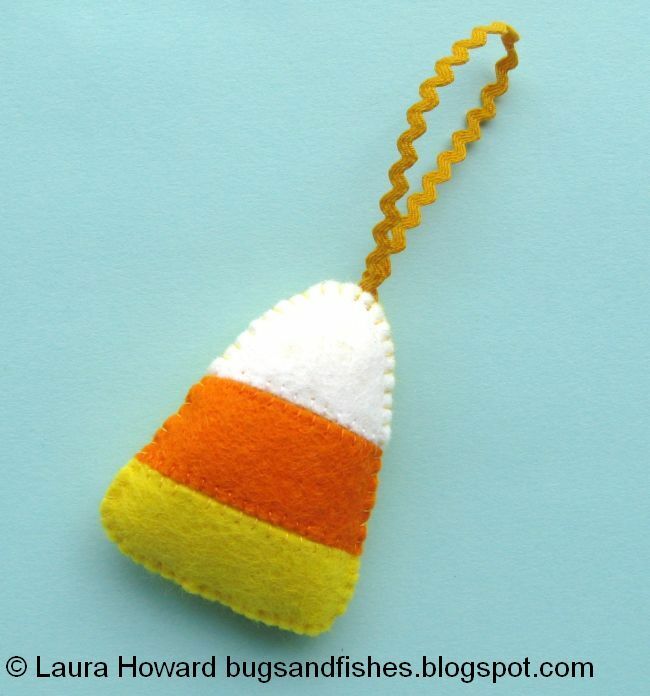 Place the front and back of your candy corn together. Start from the bottom and join the edges together with whip stitch and matching thread, sewing through the ribbon as you pass it. Leave the bottom edge open. 8. Stuff the ornament lightly, then sew up the gap with more whip stitches. 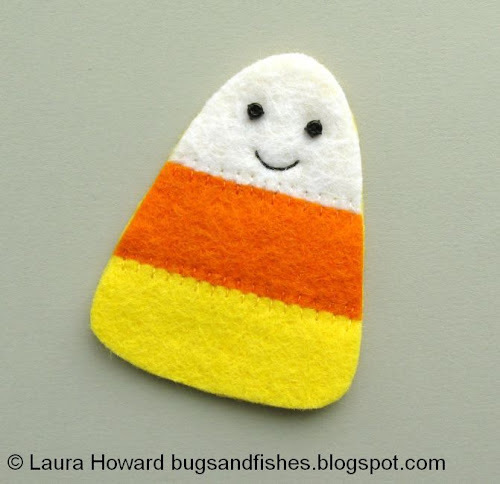 This design also makes a cute brooch! Just add a brooch clasp at step 6 instead of a ribbon loop and stitch the front & back together without adding the stuffing. 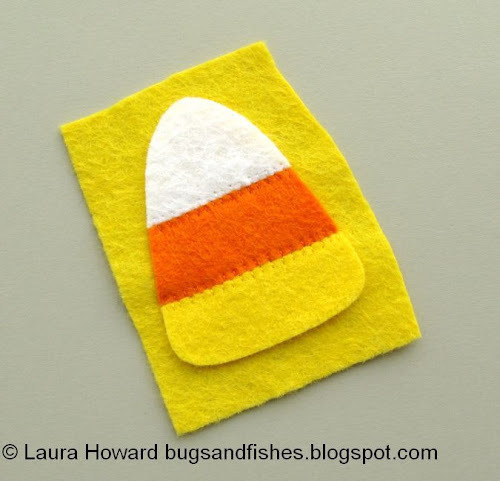 This tutorial is for non commercial use only: you can use it to make as many felt candy corn as you want for yourself or as gifts, but please don't make any for sale. You may borrow a couple of photos if you want to blog about this project, but remember to credit me and link back to this page on my blog, and do not reproduce my entire tutorial / share my templates on your site. Thanks! I just love your happy candy corn. Even though I don't eat it, it's my favorite Halloween decoration. 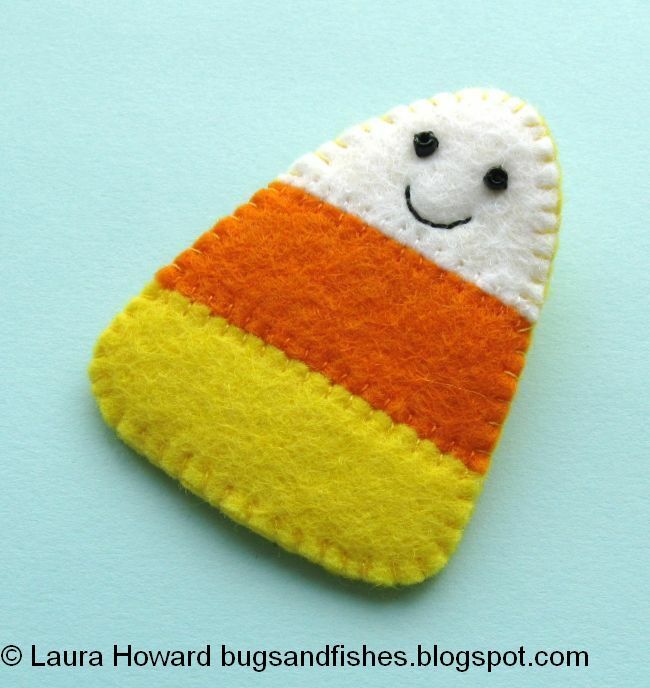 I finally have printed the pattern... now I hopefully have all three colors of felt in my stash! Some happy stitching will be happening this afternoon! Thank you Laura for the most adorable creation... they just make you smile! Kathi - Yay! 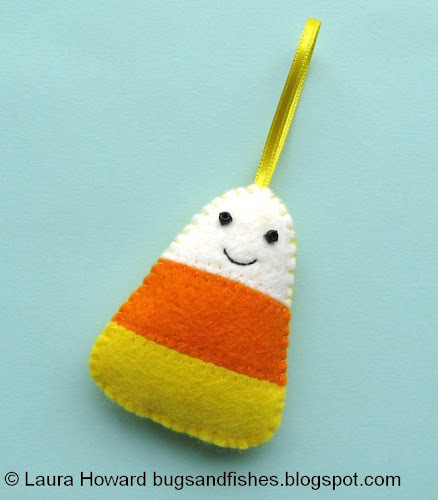 I hope you'll enjoy stitching your ornaments.